22 jun 2017 - Hoe gaan we om met tijdelijkheid in stedelijke ontwikkeling? Wie zijn de verschillende belanghebbenden? Hoe tijdelijk is tijdelijk? En hoe kunnen we adequaat reageren in dat proces van tijdelijkheid? Tijdens de college tour ‘Responding quickly by temporary use in urban development' werd, vanuit verschillende invalshoeken, op deze vragen ingegaan. Dit artikel is alleen in het Engels beschikbaar. TU Delft alumni Rick de Boer (Arcadis) kicked off the College Tour by telling the varied audience (academics, students, developers, municipalities, entrepreneurs) about his graduation research ‘Interim area development: a research on the potential value of temporary use of space’. De Boer graduated in 2013 and the financial crisis intensively determined his graduation topic. Due to the persistent financial crisis, many urban area developments have been delayed or canceled causing large wastelands. At the same time, area development underwent a major transition from a quantitative and supply-driven market to a more qualitative and demand-driven market. Although we can say that the financial crisis is mostly over now, this graduation project did not lose its relevance. The financial crisis asked for creativity since the temporary use of wasteland was a necessity. Nowadays temporary use might not be a necessity anymore, but we learned that temporary use can not only generate an impulse in the short term but it can be of value on the long term and even influence the permanent situation (Bishop, 2012). To illustrate the different aims and outcomes of temporary use, De Boer explained the situation of the building of the faculty of architecture in Delft; once meant as a temporary solution, has been turned into a permanent situation. And temporary use can also function as a site for testing the Open Lab Ebbinge in Groningen shows. 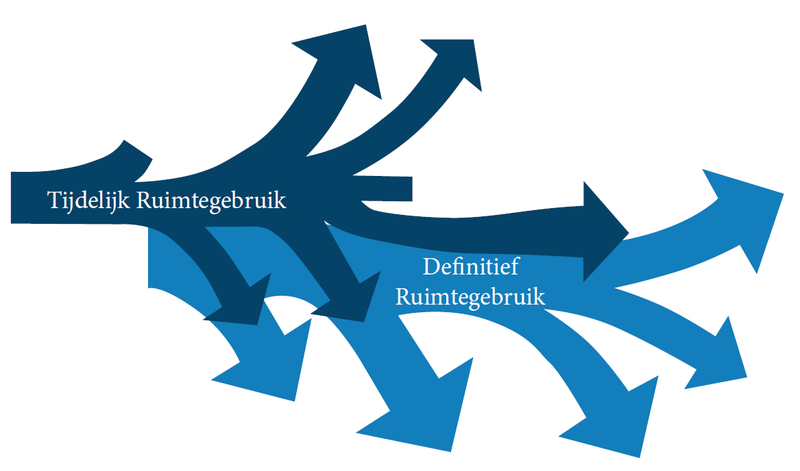 In his research, De Boer deals with different typologies of temporary functions. In this division (Oswalt et al, 2013) the role temporary use has in urban area development is defined by its distinctive characteristic. There are nine different typologies (see image below). De Boer collected around 50 projects, with different typologies, in which temporary use is applied. An important conclusion is that the impulse of temporary use for an area does not depend on the size of the investment; small investments can generate a big boost. 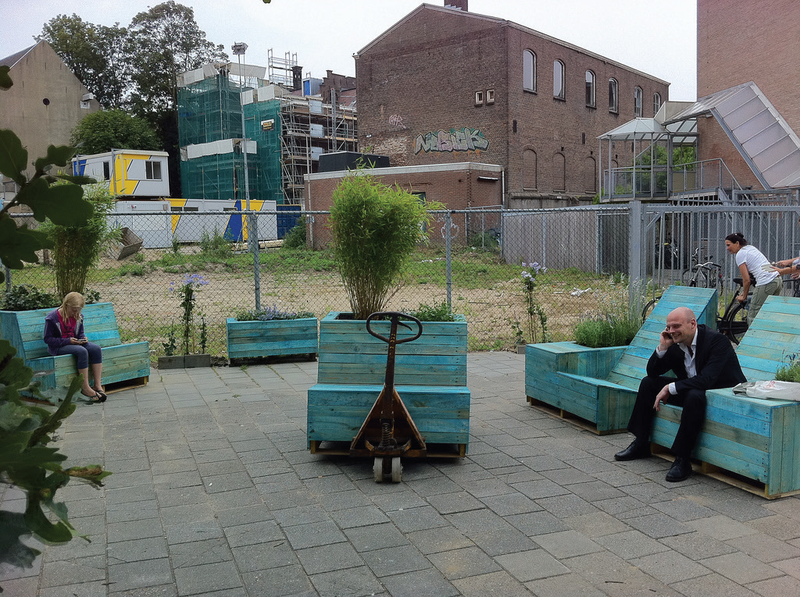 A good example are the traveling gardens in Arnhem (see image below); by rebuilding old pallets into flexible street furniture and combining it with some green, a simple intervention in public space improves the social cohesion of the surrounding neighborhoods. While in this case the aim of causing a growth in social cohesion between locals worked out, a student points out that temporary use of space in Berlin, a city with a lot of temporary use of space, is often conceived as a touristic event and does not lead to more use of the space by local residents. Furthermore noticeable is that in many cases the government is the initiator of temporary use in urban development. Municipalities stimulate temporary use of space in different ways; by providing knowledge and land, giving grants or easing legal procedures. De Boer finishes with his statement that temporary area development can have a big positive impact, also on the permanent development of urban areas, when temporary use of space is seen as a strategic tool that uses the legal and financial opportunities. Project developer BPD shifted from greenfield development to more brownfield, urban, development. Bas Kalter and Hans-Hugo Smit (BPD) acknowledge the added value of temporary use in urban development for the longer term. That is one of the things project developers learned from the crisis. As an example, the bar ‘Kompaan’ was located in the Binckhorst that functions as placemaker. Kalter and Smit explain more in detail which challenges they faced in the process of temporary urban development of the tiny houses in Erasmusveld, Wateringse Veld in The Hague. The tiny house movement originated from America and becomes more and more popular in the Netherlands since a few years. The idea is that residents of the tiny houses experience more freedom, among other things because they have affordable housing costs. This process of temporary urban development involves committing different parties, exploring financial opportunities and making it all happen. Kalter: ‘Making the five tiny houses happen took one year’. BPD had to explain the municipality of The Hague what the difference is between a trailer park and tiny houses, since the municipality had a lot of problems with trailer parks in the past. Kalter says that it has everything to do with the intention of the residents. Residents of tiny houses want to live with just the bare necessities in a sustainable, autarchic way and expose this way of living to the outside world. Kalter: ‘As a visitor you can get a tour by the resident in their tiny house’. In order to build these tiny houses, the building regulations had to be adjusted. Since there are for instance requirements for a minimum floor surface. The alderman of housing in The Hague wanted to take a tolerance policy to make the tiny houses happen for two years. These tiny houses can stay on their spot for two years, afterwards they have to be moved to another place. Finding a location for a tiny house is not that easy in the Netherlands. Because of changing regulations in the future, it possibly becomes easier to locate tiny houses more permanent. Frits Lely (Heijmans) gives us an insight on the perspective of the user living in a tiny house. The concept of the tiny house ‘Heijmans ONE’ was born out of the connection between two issues: a forgotten target group, in need for affordable temporary rental housing and the desolate view of the wastelands that occured during the financial crisis. 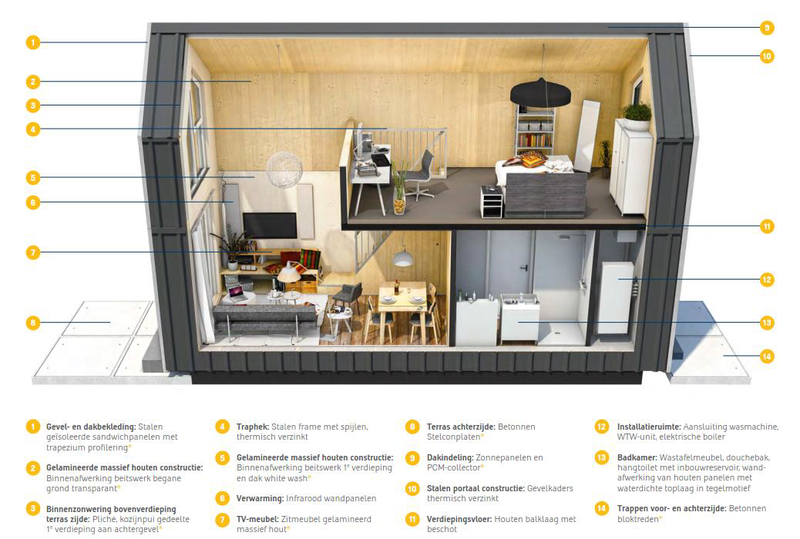 With the requirements ‘simple, achievable and affordable’ Heijmans put this new housing concept into the market. The Heijmans ONE is attractive to social housing companies. The main construction of this tiny house has a lifecycle of 50 years. As a part of the master curriculum, students from the TU Delft do a project on temporary use in the area ‘Cruquius’ in Amsterdam. Cruquius has to become a part of the city where you can live, work and recreate in a sustainable way. The development takes more time than planned, so in the ‘meantime’ temporary use of space could take place to function as placemaking for Cruquius. The students pitched their ideas for this temporary use of the area, in which the quality of the industrial atmosphere played a major role. To conclude, Martijn Drosten (Sweco Nederland), reflected on the speakers. Drosten graduated in 2014 at the Master City Developer with his research on temporary use of space as a planning strategy for urban development. According to Drosten, the fact that this college tour on temporary use takes place anno 2017, shows that temporary use was not just a hype during the crisis but is still relevant today. However, temporary use of space is still often seen as a solution for the ‘meantime’ in an urban area development, but as pointed out in this college tour once again, it also appears to be valuable on different scales in the longer term and as a new development methodology within the changing context of area development. Nevertheless, the principle of temporary use is not common in the Dutch spatial planning practice. Therefore Drosten questioned how temporary use can function as a strategic planning principle to be deployed by the municipal government. Drosten recommends the students to think big, to take a broader picture and search for the value the Cruquius area could have in Amsterdam. To make a connection with the local entrepreneurs that are already there. Moreover, to not be distracted by the term ‘temporary’, since temporary use could turn into something permanent if it has added value for the urban development. So to think about adaptive strategies that could be implemented in the more permanent urban development. As confirmed by the municipality of Amsterdam, allthough the housing market is very tense since everybody wants to build, there is time (five maybe not ten years) to start this placemaking process. A good prospect is the Environmental law (Omgevingswet) by which temporary use might become easier applicable. Bishop, P. & Williams, L. (2012). The Temporary City. London: Routledge. Oswalt, P. et al. (2013). Urban Catalyst: The Power of Temporary Use. London: DOM Publishers.